Catfish King is Having Grand Opening Right Now, LIVINGSTON, May 6, 2008 - David Beard's Catfish King has a grand opening going on right now. Catfish King is located right off of Highway 59 just north of the Livingston overpass on the right hand side of the highway. 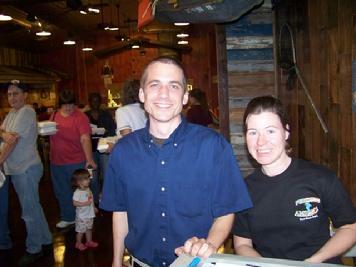 Today (May 6, 2008) was the first day of business as the restaurant re-launched since it was burned down over a year ago. David Beard himself was in attendance earlier in the day when the restaurant opened. Manager Jason Rodgers gave PolkCountyToday.com a tour of the brand new restaurant and building. Business seemed robust as the parking lot was filled and the smell of fried catfish filled the air. The whole place is very new and very clean. The employees all seem to have a sense of purpose and are cheerful. The new building is gorgeous including the dining areas and sports a clean but rustic decor style that East Texans are comfortable with. Rodgers stated that Catfish King has senior citizen discounts at all times. Rodgers pointed out that Catfish King boasts all American farm raised catfish that are all natural and not given any kind of growth hormones or steroids. He also pointed out that all their beef is fresh cut that includes hamburgers, and chicken fried steaks, and he said that people love their salad bar. Manager Jason Rodgers, and Hostess Sarah Wallace will greet with a smile. 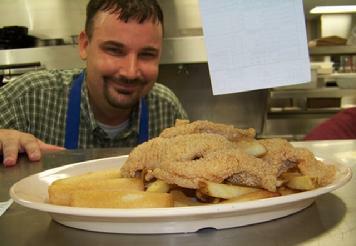 Kitchen Manager Clayton Syzdek is proud of what Catfish King has to offer.